All of the teams are in Princeton now, resting up before the action begins at 10am tomorrow. What can we do until then? Well, we can have fun analyzing the entry and start lists! Leone Timing released the entry and start lists on the live results website – check them out. We did and compared who is entered and their seasonal best performances to get an idea of what the projected scores could be come the end of the day on Sunday. Of course, this score does not include estimated rankings for those who are entered without a time or performance (i.e. long-distance athletes, relay teams) so they are a little inaccurate in that regard. For the women, Harvard leads over host Princeton by over 100 points while Cornell and Penn could be battling it out over making the third position. The Ivy League Digital Network will provide webstreaming coverage starting at 11:45am on Day 2. 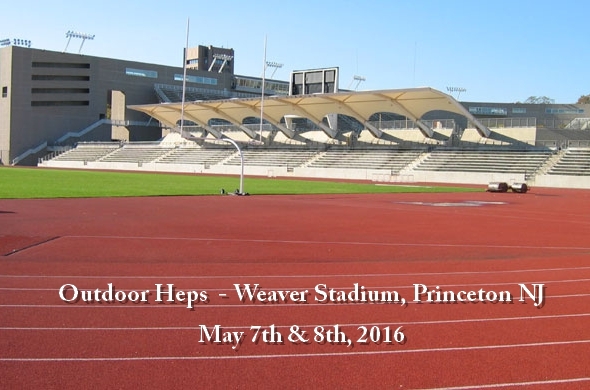 Announcers this year will include Bill Spaulding (Harvard broadcaster, was play by play at Ivy Heps Indoor Championships), Robert Johnson (Princeton alum, former Cornell assistant, co-founder of LetsRun.com) and Dave Hunter (Princeton alum, track & field writer and broadcaster). To watch the meet, you will need to subscribe a Day Pass through this link: http://www.ivyleaguedigitalnetwork.com/packages, choose their school (under “School Packages”) and select “School Day Pass.” Their subscription will be good for 24 hours from the time they finalize the purchase. The meet will be simulcasted on Flotrack, which you can watch through a FlotrackPro subscription. Flotrack will be at the meet on Saturday and post any videos from Day 1 on their website once Day 1 activities are done. This too is viewable through a FlotrackPro subscription. And of course, this website, but please refresh frequently to get the most up-to-date information. This entry was posted on Friday, May 6th, 2016 at 7:36 pm. It is filed under Heps Champs, Spotlight. You can follow any responses to this entry through the RSS 2.0 feed.